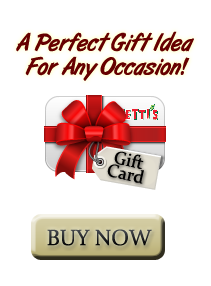 Whether gathering at the office or at home, Cinzetti’s Party To-Go lets you bring the flavors and variety of an Italian Feast to any group, anywhere. Choose your price per person by your menu needs and let us know if you have special requests. Up to two toppings: pepperoni, sausage, tomato, onion, garlic, mushrooms and peppers. Five person minimum for all orders. Prices Exclude tax. Delivery available. Additional charges may apply. Call for details.